This article is about the post-April 2015 registered charity. For the statutory body with responsibility for listing, see Historic England. English Heritage (officially the English Heritage Trust) is a charity that manages over 400 historic monuments, buildings and places. These include prehistoric sites, medieval castles, Roman forts and country houses. The charity states that it uses these properties to ‘bring the story of England to life for over 10 million people each year’. Within its portfolio are Stonehenge, Dover Castle, Tintagel Castle and the best preserved parts of Hadrian's Wall. English Heritage also manages the London Blue Plaque scheme, which links influential historical figures to particular buildings. On 1 April 2015, English Heritage was divided into two parts: Historic England, which inherited the statutory and protection functions of the old organisation, and the new English Heritage Trust, a charity that would operate the historic properties, and which took on the English Heritage operating name and logo. The British government gave the new charity an £80 million grant to help establish it as an independent trust, although the historic properties remained in the ownership of the state. Over the centuries, what is now called 'Heritage' has been the responsibility of a series of state departments. There was the 'Kings Works' after the Norman Conquest; the Office of Works (1378–1832); the Office of Woods, Forests, Land Revenues and Works (1832–1851); and the Ministry of Works (1851–1962). Responsibility subsequently transferred to the Ministry of Public Building and Works (1962–1970) then to the Department of the Environment (1970–1997) and now the Department for Culture, Media and Sport (DCMS). The state's legal responsibility for the historic environment goes back to the Ancient Monuments Protection Act 1882. Central government subsequently developed several systems of heritage protection for different types of 'assets', introducing listing for buildings after WW2 and conservation areas in the 1960s. In 1983 Secretary of State for the Environment Michael Heseltine gave national responsibility for the historic environment to a semi‑autonomous agency (or 'quango') to operate under ministerial guidelines and to government policy. The Historic Buildings and Monuments Commission was formed under the terms of the National Heritage Act 1983 on 1 April 1984. The 1983 Act also dissolved the bodies that had previously provided independent advice – the Ancient Monuments Board for England and the Historic Buildings Council for England and incorporated these functions in the new body. Soon after, the commission gained the operating name of English Heritage by its first Chairman, Lord Montagu of Beaulieu. 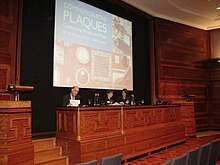 English Heritage commemorative plaques conference, 2010. English Heritage began administering the London Blue Plaques in 1986. A national register of historic parks and gardens, (e.g. Rangers House, Greenwich) was set up in 1984, and a register for historic battlefields (e.g. the Battle of Tewkesbury) was created in March 1995. 'Registration' is a material consideration in the planning process. In April 1999 English Heritage merged with the Royal Commission on the Historical Monuments of England (RCHME) and the National Monuments Record (NMR), bringing together resources for the identification and survey of England's historic environment. By adoption this included responsibility for the national record of archaeological sites from the Ordnance Survey; the National Library of Aerial Photographs, and two million RAF and Ordnance Survey aerial photographs. These, together with other nationally important external acquisitions, meant that English Heritage was one of the largest publicly accessible archives in the UK: 2.53 million records are available online, including more than 426,000 images. In 2010–2011 it recorded 4.3 million unique online user sessions and over 110,000 people visited NMR exhibitions held around the country in 2009/10. In 2012 the section responsible for archive collections was renamed the English Heritage Archive. As a result of the National Heritage Act 2002, English Heritage acquired administrative responsibility for historic wrecks and submerged landscapes within 12 miles of the English coast. The administration of the listed building system was transferred from DCMS to English Heritage in 2006. However, actual listing decisions still remained the responsibility of the Secretary of State for Culture, Media and Sport, who is required by the Planning (Listed Buildings and Conservation Areas) Act 1990 to approve a list of buildings of special architectural or historic interest. Following the Public Bodies Reform in 2010, English Heritage was confirmed as the government's statutory adviser on the historic environment, and the largest source of non-lottery grant funding for heritage assets. It was retained on grounds of "performing a technical function which should remain independent from Government". However the department also suffered from budget cuts during the recession of the 2010s resulting in a repairs deficit of £100 million. In June 2013 the British Government announced plans to provide an £80 million grant to enable English Heritage to become a self-financing charity (roughly following the precedent set by the transformation of the nationally owned British Waterways into the Canal & River Trust). The national portfolio of historic properties remain in public ownership, but the new English Heritage will be licensed to manage them. The change occurred on 1 April 2015 with the statutory planning and heritage protection functions remaining an independent, non-departmental public body, rebranded as Historic England. The care of the properties in the National Collection and the visitor experience attached to them were transferred to the new English Heritage Trust, although the English Heritage name and logo remains. The new trust has a licence to operate the properties until 2023. Stonehenge, one of English Heritage's most famous sites. Stonehenge visitor centre. Opened in December 2013, over 2 km (1.2 mi) west of the monument, just off the A360 road in Wiltshire. English Heritage is the guardian of over 400 sites and monuments, the most famous of which include Stonehenge, Iron Bridge and Dover Castle. Whilst many have an entry charge, more than 250 properties are free to enter including Maiden Castle, Dorset and St Catherine's Oratory. The sites are part of the portfolio of over 880 historical places across the UK amassed by the British Government between the 1880s and the 1970s to form the National Collection of built and archaeological heritage. (The balance is in the care of Historic Scotland and Cadw.) These sites represent a deliberate attempt by the state in the 19th and early 20th century to take the nation's most significant prehistoric sites and medieval sites, which were no longer in active use, into public ownership. This national property collection performs the same function as pictures in the National Gallery and the archaeological material in the British Museum. Unlike the National Trust, English Heritage holds few furnished properties. New sites are rarely added to the collection as other charities and institutions are now encouraged to care for them and open them to the public. One recent acquisition, in late 2011, was the Harmondsworth Barn in west London, close to Heathrow airport. The properties are held by English Heritage under various arrangements. The majority are in the guardianship of the Secretary of State for the Department for Culture, Media and Sport with the freehold being retained by the owner. The remaining properties are either owned by English Heritage, other government departments or the Crown Estate. In 2013–14 there were 5.73 million visits to staffed sites, with 713,000 free educational visits to sites, collections and tailored learning activities and resources. As a charitable trust, English Heritage relies on the income generated from admission fees to its properties, membership fees and trading income from (e.g.) catering, holiday cottages and shops. It also has income from fundraising and grants. To ease the transition, the government has supplied £80 million a year until 2023 to cover the backlog of maintenance to the sites in English Heritage's care. Previously, when English Heritage was a non-departmental public body and included the functions of planning, listing, awarding grants, heritage research and advice, most of its funding came from government. In 2013–2014, English Heritage had a total income of £186.55 million of which £99.85 million came from grant-in-aid, with the remaining £86.7 million from earned sources. This included £17.47 million from property admissions, £14.96 million from catering and retail, £22.91 million from membership and £26.39 million from donations and grants. The trust's financial plan sees the annual requirement for subsidy being cut from £15.6 million in 2015/16 to £10.1 million in 2020/21 and zero in 2022/23. Members of the public are encouraged to join English Heritage as "members". Membership provides benefits such as free admission to its properties and member-only events as well as reduced-cost admission to associated properties. Members also get access for free or reduced cost to properties managed by Cadw in Wales, Historic Scotland, the Office of Public Works in the Republic of Ireland, Manx National Heritage on the Isle of Man and Heritage New Zealand. In 2014/15 there were 1.34 million members. However membership does not convey voting rights or influence over the way English Heritage is run. Participation in consultations and web-based surveys by English Heritage is not restricted to its membership. It invites various groups and members of the public to give views on specific issues, most notably in recent years about the Stonehenge road tunnel project proposals. The organisation welcomes volunteers. Roles range from room stewarding, running education workshops and gardening, to curatorial cleaning and research. In 2014/15 the number of regular volunteers reached 1,872 up from 1,473 in 2013/14. 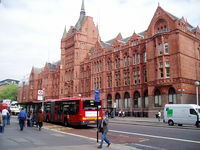 English Heritage's London office at Holborn Bars. English Heritage is governed by a Trustee Board who set the strategic direction of the organisation and ensure that the organisation delivers its goals and objectives. It is led by the Chairman, currently Vice Admiral Sir Tim Laurence. Other trustees are Alex Balfour, Vicky Barnsley OBE, Sukie Hemming, Ronald Hutton, Kate James-Weed, Sir Laurie Magnus, Ian McCaig, Malcolm Reading, Sarah Staniforth, James Twining and Charles Gurassa. Operational management is delegated to the chief executive, Kate Mavor who began on 5 May 2015 after moving from the National Trust for Scotland. The chief executive is supported by an Executive Board of eight directors. 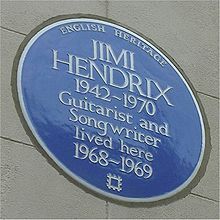 A typical English Heritage "blue plaque", here marking the former London residence of guitarist Jimi Hendrix at 23 Brook Street. English Heritage has administered the blue plaque scheme in London since 1986. These recognise places important to people of significance in the capital and remain the responsibility of English Heritage following the transfer to the voluntary sector in 2015. For a short period English Heritage trialled plaques outside of London. Plaques have been placed in Liverpool, Birmingham and elsewhere. The scheme was discontinued. Many other plaques have been created throughout the UK (including London) by town councils, district councils, civic societies, historical societies, fan clubs, companies, and individuals. These are not managed or require approval from English Heritage. An open register is available at Open Plaques. In 1999 a pressure group, the Revived Cornish Stannary Parliament, wrote to English Heritage asking them to remove all signs bearing their name from Cornish sites by July 1999 as they regarded the ancient sites as Cornish heritage, not English. Over a period of eleven months members of the Cornish Stannary removed 18 signs and a letter was sent to English Heritage saying "The signs have been confiscated and held as evidence of English cultural aggression in Cornwall. Such racially motivated signs are deeply offensive and cause distress to many Cornish people". On 18 January 2002, at Truro Crown Court, after the prosecution successfully applied for a Public Immunity Certificate to suppress defence evidence (these are normally issued in cases involving national security), three members of the group agreed to return the signs and pay £4,500 in compensation to English Heritage and to be bound over to keep the peace. In return, the prosecution dropped charges of conspiracy to cause criminal damage. In 2011, Conservative MP George Eustice stated that Cornish heritage "is not English" and that there is "a growing feeling that Cornwall should have its own heritage organisation, taking over from English Heritage." He suggested that English heritage be replaced "with a Cornish Heritage group, just like they have for instance in Wales and Scotland." The then Culture Secretary Jeremy Hunt was called upon to give cash to a new autonomous body in Cornwall by "top slicing" English Heritage's budget. 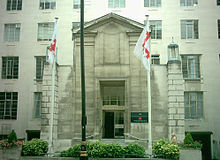 In 2006, The Secretary of State at the DCMS issued a certificate of exemption from listing for Fortress House, the then English Heritage headquarters. In 2009, it was demolished and the site redeveloped for a commercial office building. 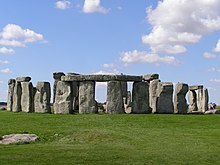 In 2010 the organisation sent an email to open access photograph agency fotoLibra, attempting to ban the unauthorised commercial use of photographs of Stonehenge. A subsequent statement of regret was issued, clarifying that "We do not control the copyright of all images of Stonehenge and have never tried to do so." The organisation added that they request that commercial photographers pay fees and abide by certain conditions. ^ a b c d e f g "English Heritage Annual Report and Accounts 2014/15" (PDF). Historic England. 14 July 2015. Archived from the original (PDF) on 10 October 2015. Retrieved 20 February 2016. ^ a b c d e f "English Heritage Annual Report and Accounts 2013/14". Historic England. Historic England. Archived from the original on 13 April 2015. Retrieved 6 April 2015. ^ a b c d "Our History". English Heritage. English Heritage Trust. Retrieved 6 April 2015. ^ a b "New Era for English Heritage". English Heritage. English Heritage Trust. Retrieved 6 April 2015. ^ a b Lean, Geoffrey (28 February 2015). "Does our history have a future in the hands of the English Heritage Trust?". The Telegraph. Retrieved 6 April 2015. ^ English Heritage leaflet "The evolution of the National Monument Record"
^ "AMA-1882 Ancient Monuments Act". Archived from the original on 17 August 2011. Retrieved 13 May 2011. ^ "National Heritage Act 1983". Retrieved 13 May 2011. ^ "English Heritage Annual Report 2010-2011". English Heritage. Retrieved 15 July 2011. ^ "National Heritage Act 2002". Retrieved 13 May 2011. ^ "Public Bodies Reform – Proposals For Change" (PDF). Retrieved 13 May 2011. ^ "Historic Environment". Retrieved 13 May 2011. ^ "£80 Million Boost for Heritage". English Heritage. 26 June 2013. Retrieved 4 July 2013. ^ "English Heritage to become a charitable trust". Salon: Society of Antiquaries of London Online Newsletter. 301. 1 July 2013. ^ "Measure for Treasure: Dr Simon Thurley, head of English Heritage, on philanthropy, funding and the future of heritage". PrimeResi.com. Retrieved 24 September 2013. ^ "See English Heritage history for free". Retrieved 10 May 2011. ^ a b "English Heritage Information Pack 2010". Retrieved 10 May 2011. ^ a b "Our Priorities". English Heritage. English Heritage Trust. Archived from the original on 11 September 2015. Retrieved 6 April 2015. ^ "Join". English Heritage. English Heritage Trust. Retrieved 6 April 2015. ^ "Other Associated Attractions". English Heritage. English Heritage Trust. Retrieved 6 April 2015. ^ "Consultations". English Heritage. Retrieved 6 May 2011. ^ Volunteer. English Heritage. Retrieved on 7 April 2015. ^ a b c "Our People". English Heritage. English Heritage Trust. Retrieved 7 April 2015. ^ "The commemoration of historians under the blue plaque scheme in London". Retrieved 16 May 2011. ^ "Local Government Act 1985, Schedule 2 Listed buildings, conservation areas and ancient monuments". Retrieved 16 May 2011. ^ "Historic signs case trio bound over". BBC News. 18 January 2002. Retrieved 17 March 2013. ^ "Heritage is not English; it's ours". This is Cornwall. 29 September 2011. Retrieved 17 March 2013. ^ "Cornish MP is critical of English Heritage". BBC News. 11 October 2011. Retrieved 17 March 2013. ^ "MP calls for 'Cornish Heritage' to replace English body". This is Cornwall. 11 October 2011. Archived from the original on 13 October 2013. Retrieved 17 March 2013. ^ Joseph Mirwitch (May 2006). "Fortress House Threatened". The Twentieth Century Society. Archived from the original on 10 March 2012. Retrieved 17 March 2013. ^ "A new suit on Savile Row". Mace. Archived from the original on 25 November 2010. Retrieved 17 March 2013. ^ Cheesman, Chris (22 October 2010). "Stonehenge bosses 'regret' photography ban (update)". Amateur Photographer. Archived from the original on 18 March 2012. Retrieved 27 October 2011. The storm centred on a message sent to picture agency fotoLibra which read: 'We are sending you an email regarding images of Stonehenge on your fotoLibra website. [...] The statement, published on the English Heritage website, adds: 'We do not control the copyright of all images of Stonehenge and have never tried to do so. [...] 'If a commercial photographer enters the land within our care with the intention of taking a photograph of the monument for financial gain, we ask that they pay a fee and abide by certain conditions. Thurley, Simon (2013). Men from the Ministry: How Britain Saved its Heritage. New Haven and London: Yale University Press. ISBN 978-0-300-19572-9. Wikimedia Commons has media related to English Heritage.